From left: Checkered Flag BMW General Manager Todd Collins, St. Mary’s CEO William C. Giermak, Auxiliary Board President Mollie Pavlik, lucky car winner Eugene Adams, St. Mary’s Director of Annual Giving Mary Helen Hilton and Auxiliary Board Treasurer Marie Siebeking. NORFOLK, Va. (May 2, 2016) — Eugene Adams, 91, pulled up to St. Mary’s Home in a 25-year-old Jeep. He drove away from the nonprofit in a brand new Toyota Corolla. 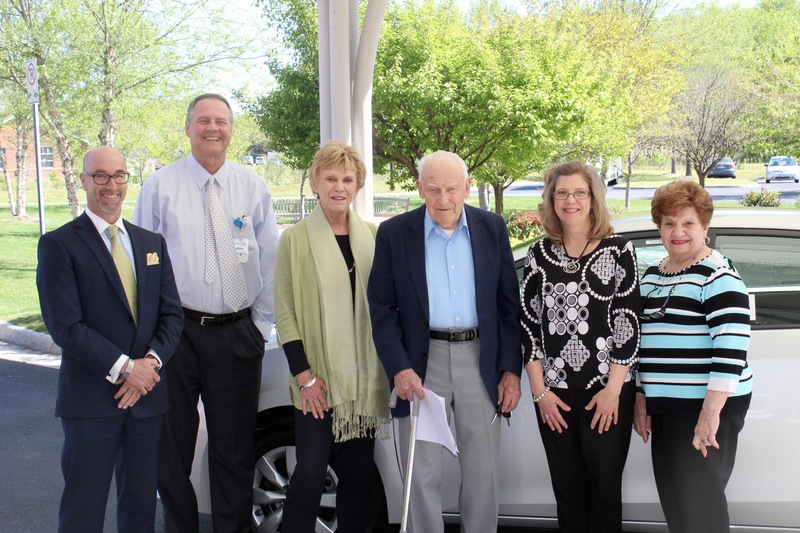 Checkered Flag Auto Group, which operates multiple dealerships in Virginia Beach, donated the silver car for the Auxiliary Board of St. Mary’s Home to raffle. Adams bought the winning ticket in the drawing, which raised about $20,000 to help 100 children and young adults with severe disabilities who live at St. Mary’s. Auxiliary Board President Mollie Pavlik handed over the keys to Adams when his daughter brought him to St. Mary’s to sign paperwork to take ownership of the car. She told him she was very excited that he had won. “YOU’RE excited?” Adams replied with a grin. Todd Collins, general manager of Checkered Flag BMW, arranged the giveaway and was on hand to greet Adams and show him some of the car’s features. This was the sixth year in a row that Checkered Flag donated a car to the Auxiliary raffle. The winning ticket was pulled during the Auxiliary’s Gala and Auction on April 16 at the Half Moone Cruise & Celebration Center in Norfolk. Adams said he bought his raffle tickets — 10 in all for a total of $200 — to help the children of St. Mary’s. The Virginia Beach resident met his wife in 1946 when he was a Corsair pilot on the USS Midway aircraft carrier at Oceana Naval Air Station. They were married nearly 67 years when she passed away in 2014. He said he’d never won anything before, except for a basket of groceries. The car, he said, was a much better prize. About St. Mary’s Home: St. Mary’s Home in Norfolk provides around-the-clock, specialized residential care for 88 children and 12 adults from throughout Virginia who have multiple, severe disabilities. With the opening of The Albero House at St. Mary’s in 2013 to provide care for adults 22 and over, St. Mary’s Home has shortened its name from St. Mary’s Home for Disabled Children. This entry was posted in Auxiliary Board, Checkered Flag, news by marcomm. Bookmark the permalink.